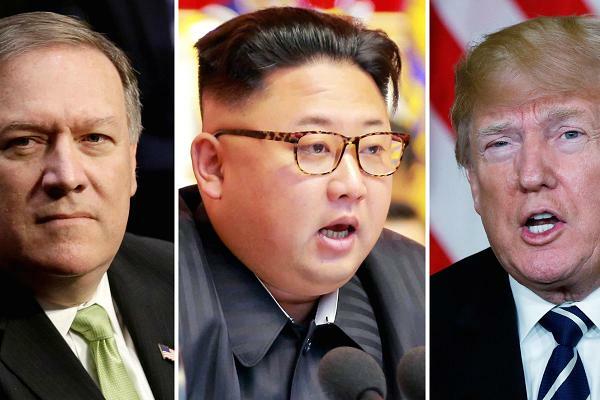 (by Yaron Steinbuch, New York Post) – President Donald Trump confirmed via Twitter early Wednesday that his CIA chief secretly met with North Korean despot Kim Jong Un — and formed “a good relationship” heading into the two leaders’ anticipated summit. “Mike Pompeo met with Kim Jong Un in North Korea last week. Meeting went very smoothly and a good relationship was formed,” Trump tweeted. 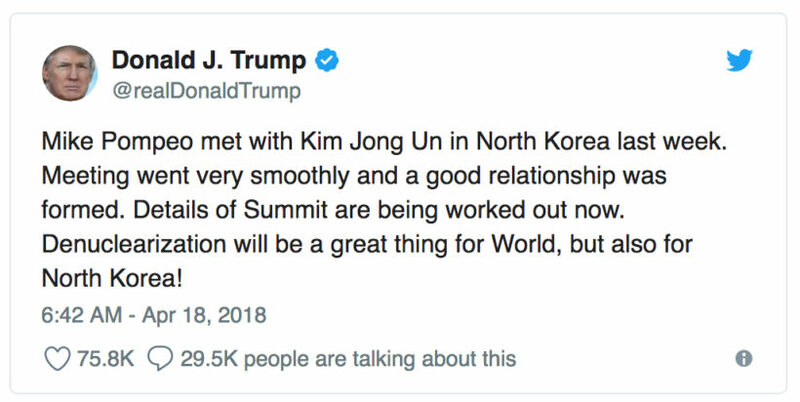 “Details of Summit are being worked out now. Denuclearization will be a great thing for World, but also for North Korea!” Trump added from his Florida estate, Mar-a-Lago, where he is hosting Japanese Prime Minister Shinzo Abe. The president disclosed Tuesday that the US and the rogue regime were holding direct talks at “extremely high levels” in preparation for a possible summit. Confirmation of Pompeo’s trip later came from two officials who spoke on condition of anonymity. The Washington Post reported that it took place over Easter weekend, shortly after Pompeo was nominated to become secretary of state. Kim’s shocking offer for a summit was initially relayed last month to Trump by South Korean officials — and the president surprised many by accepting it. US officials have indicated that Pyongyang had communicated directly with Washington that it was ready to discuss [ending] its nuclear weapons program. A summit would be the first ever between the two countries, which do not have formal diplomatic ties, during more than six decades of hostility since the Korean War. 2. What position does Mike Pompeo currently hold in the Trump administration? To which position has Pompeo been nominated by President Trump? 3. a) Why did Mr. Pompeo meet with Kim Jong Un? b) What was the outcome of the meeting? 4. What is the ultimate goal for a meeting with North Korea’s Kim Jong Un? 5. What is the significance of this potential meeting? 6. North Korea’s history of regional military provocations; proliferation of military-related items; WMD programs including tests of nuclear devices in 2006, 2009, 2013, 2016 and 2017 (long-range missile development; as well as its nuclear, chemical, and biological weapons programs) and massive conventional armed forces – have been of major concern to the entire world for many years. 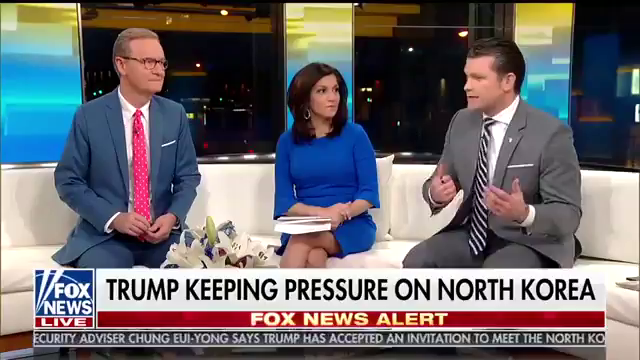 In 2017, many commentators warned that President Trump’s tough talk against Kim Jong Un might cause the dictator to take military action. Only time will tell if President Trump’s strategy will be a success, or if his detractors are correct. What do you think? Chinese state media reported that China and the U.S. agreed that efforts to denuclearize the Korean Peninsula should be “complete, verifiable and irreversible,” after high level talks in Washington. … Chinese state media described the talks, the first of their kind with the Trump administration, as an upgrade in dialogue mechanisms between China and the U.S., following President Xi Jiping’s meeting with President Trump in Florida in April. On Monday, September 11, 2017, the United Nations Security Council unanimously adopted a US-drafted resolution to impose new sanctions on North Korea — a move that came just one week after the rogue nation carried out its sixth and largest nuclear test. “We are done trying to prod the regime to do the right thing, we are now trying to stop it from having the ability to do the wrong thing,” she added. China welcomed news of the meeting between CIA Director Mike Pompeo and Kim Jong Un, heralding the move as a “right start” that could culminate in a peaceful resolution to the nuclear crisis. Beijing’s foreign ministry spokeswoman Hua Chunying said Wednesday at a regular press briefing that “China welcomes direct dialogue and contact between North Korea and the United States,” South Korean news agency Yonhap reported. Beijing is signatory to the 1953 Armistice, and the government plans to play “an active role” in the “denuclearization process,” the foreign ministry added. 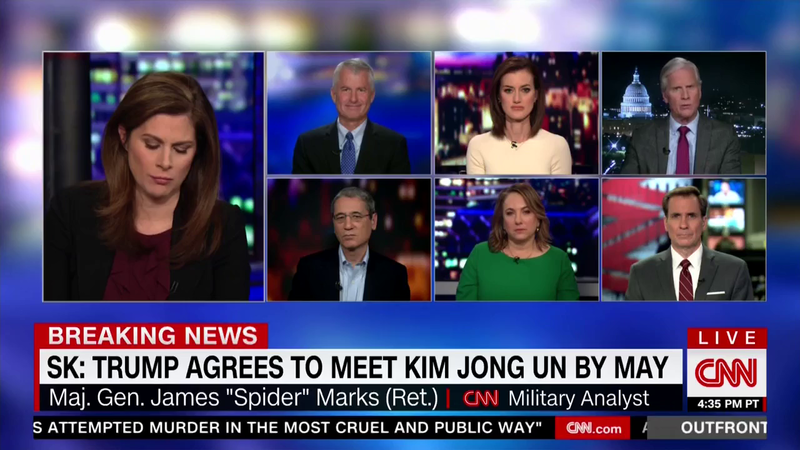 Increased levels of engagement between China and North Korea could soon culminate in Chinese President Xi Jinping’s visit to North Korea “soon,” CNN reported Wednesday. The visit could take place after U.S. President Donald Trump and Kim meet in either late May or early June.